A deep-flavored, juicy tangerine, the Robinson is worth seeking out. Those looking for a citrus fruit with superior flavor won&apos;t be disappointed. Robinsons are "related" to Page oranges, another fruit well known for its great flavor, and we recommend them as an alternative when Pages aren&apos;t available. On the larger side for a tangerine, the Robinson still has the classic tangerine shape—shorter and squatter. It has a small "neck" at its stem and is reddish-orange in color. 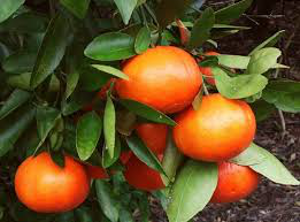 The Robinson&apos;s interesting "parentage" (they are a cross between Orlando tangelos and Clementine mandarins) guarantees a rich, deep, tangy, and delicious taste. Like most tangerines, the Robinson is very juicy. With its larger size for a tangerine, it&apos;s actually a delicious, though slightly unconventional juicing choice. If you&apos;ve never tried fresh tangerine juice, you&apos;re missing out. Tangerines are typically seeded fruit, and the Robinson is no exception. In general, you&apos;ll find an average of 10 to 20 seeds inside. The Robinson&apos;s thin skin, ease of peeling, and small to medium size makes it an appealing fruit to eat out of hand. Robinsons are an early season fruit, available mid-November through the end of the holiday season. The Robinson is actually ¾ tangerine and ¼ grapefruit. Some may find this surprising, but many of our most delicious citrus hybrids have grapefruit "parentage"—it adds full-bodied flavor. Robinsons aren&apos;t seen much in supermarkets due to their tender fragility. The great thing about a specialty fruit shipper like FFS is that we can take the extra time to treat fruit like these with the care they need. The Robinson was created in 1959 by P.C. Reece and F.E. Gardner at the U.S. Horticultural Field Station in Orlando, Florida.